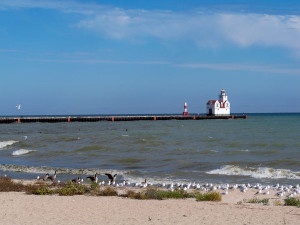 My hometown is Kewaunee, Wisconsin, a small town located on the shore of Lake Michigan. As with post WW2 generations, I learned about WW2 history in school, from reading and movies, and family stories. During WW2, individuals, families, and communities throughout the United States [US], as did mine, supported the war effort and wanted to “do their bit.” My father, Stanley “Jocko” O’Konski, worked at Kewaunee Shipbuilding and Engineering building ships for the military. An uncle, Alvin E. O’Konski, was elected to the US Congress and began his first term as a Representative in 1943. Alvin was a co-author of the GI Bill. Another uncle, Adrian E. O’Konski, was a B-17 navigator with the 8th Air Force, 306th Bomb Group, based in Thurleigh, England. Adrian flew 35 missions over Europe as a member of the Walter Sumner crew. After 25 years of active military service in the US Army and US Air Force, I retired in Texas and have pursued my interest in WW2 history. Since 2010, I have volunteered as an oral historian for the National Museum of the Pacific War located in Fredericksburg, Texas. I would like to acknowledge Norman Messmann, my Kewaunee High School history teacher, Sister M. Francis Ann, College of St. Teresa history teacher, Ed Bearss, Chief Historian Emeritus for the National Park Service, and Dr. Vernon Williams, Professor of History, Abilene Christian University, who have greatly influenced my interest in WW2 history.